SPMR Workshop in Rarotonga, Cook Islands, helps SAIs align operational and strategic plans. Rarotonga, Cook Islands: The Pacific Association of Supreme Audit Institutions (PASAI) and INTOSAI Development Initiative (IDI) continued their collaboration by delivering an Operational Planning workshop in Rarotonga, Cook Islands on 26-30 November 2018. 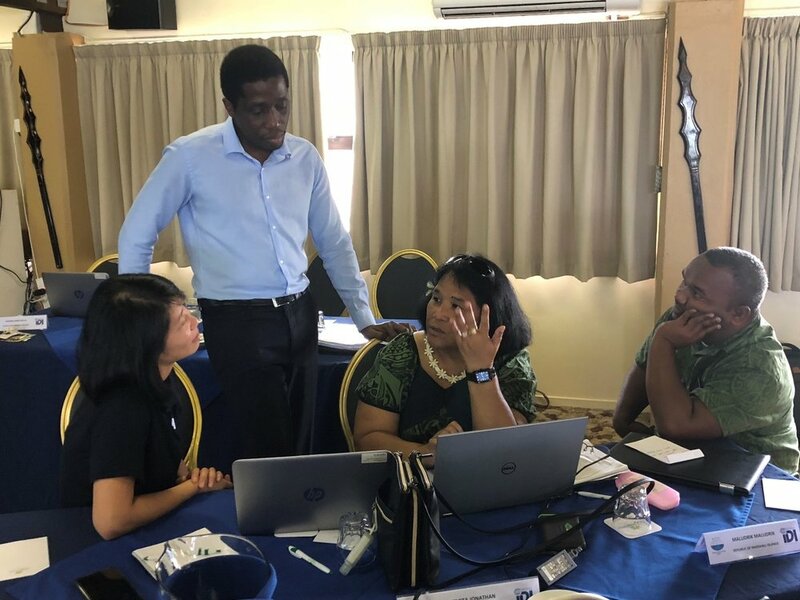 The second workshop for the Strategy, Performance Measurement and Reporting (SPMR) programme, this training builds from the foundation already established in the audit institutions’ strategic plans developed during the workshop held in Tonga earlier this year. Twenty-eight participants from the SAIs of the Cook Islands, the Federated States of Micronesia – National Office and the state audit offices of Kosrae, Pohnpei, and Yap, Guam, Papua New Guinea, Republic of the Marshall Islands, Samoa, Solomon Islands, Tonga, and Tuvalu attended the workshop to develop operational plans in alignment with their strategies. Representatives from SAI Australia (Australian National Audit Office (ANAO)) and SAI New Zealand joined them to share the experience and to provide support to their respective twinning partners, as determined under a separate arrangement between the PASAI and the Australian Council of Auditors General (ACAG). In his opening remarks, the Honourable Deputy Prime Minister and Minister of Finance and Audit, Hon. Mark Brown highlighted the critical role that government auditors play in strengthening accountability and transparency in the public sector. PASAI is one of the two INTOSAI regions piloting this global programme with the objective of ensuring that audit institutions are strategically managed leading to better performance. In a workshop facilitated by Freddy Yves Ndjemba, Dafina Dimitrova, and Irina Sprenglewski from the INTOSAI Development Initiative (IDI), assisted by Tiofilusi Tiueti and Sinaroseta Palamo-Iosefo from the PASAI Secretariat, Sarah Markley of SAI New Zealand and Rona Mellor and Penelope Edwards from SAI Australia, participants were taken from the fundamental characteristics of an operational plan through the full operational planning process. Participants worked rigorously on aligning their operational and strategic plans, developing these key organizational roadmaps holistically to ensure the audit institutions deliver the outputs and achieve outcomes accordingly. Attendees particularly appreciated the importance of this holistic approach to managing their operations and ensuring alignment with their strategic priorities in their mission to lead by example and add value to society. The next phase for the SPMR programme will involve support and the provision of tools to develop a monitoring and reporting framework for these audit institutions, thus enabling impactful reporting on performance from the audit institutions to their stakeholders. PASAI acknowledges the financial support by the IDI, Australia Department of Foreign Affairs and Trade, the New Zealand Ministry of Foreign Affairs and Trade and Asian Development Bank to conduct this programme for SAIs in the Pacific region.